The pond is heading towards its midsummer glory! Great blue lobelia (Lobelia siphilitica – lower right) isn’t blooming yet, but it will be soon. The pickerel weed (Pontederia cordata) in the pond is blooming, though, as is the replacement marsh marigold (the older plants were killed off by our late winter cold spell). The Virginia creeper (Parthenocissus quinquefolia – left, along the rocks) is spreading really nicely this year. July is the month for pond tours, at least up here at latitudes where winter lasts for months on end. If you are interested in ponds (or just at peeking at other people’s back yards), the quickest way to find a tour would be to Google “pond tour” plus your state/province/town/area. Another resource in North America is the NAWGS pond tour search, although I think their results may be a little incomplete. In greater Chicago, I know of two tours coming up. The Chicagoland Pond Tour is a free tour that runs for 4 weekends in July – see their website for which counties have ponds open on which weekend. It’s associated with NAWGS. The pond tour that my pond is on is run by the Midwest Pond and Koi Society. It runs for 4 weekend days in July, and tour maps cost $15. I’m very excited and a little bit apprehensive about showing the pond and the backyard to strangers. I’ve gone on three previous MPKS pond tours, and most people have ponds that are bigger and filled with koi. 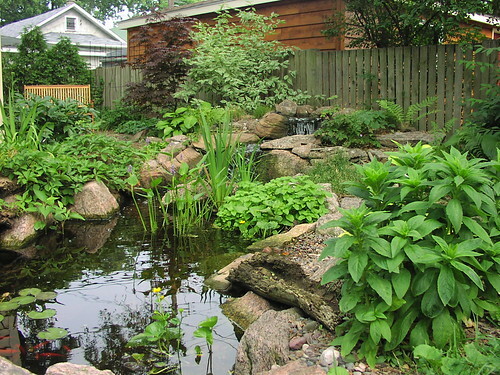 On the other hand, there are very few “small yard” ponds, so perhaps our yard can convince folks in the city and in older suburbs that they, too, can have a peaceful pond in their lives. So are you going on a pond tour this year? Try it, you’ll like it! 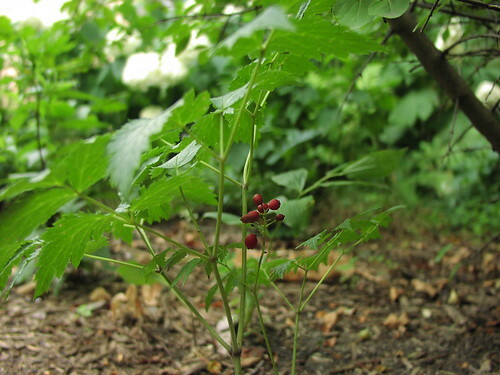 The red baneberry (Actaea rubra) bloomed when I wasn’t paying attention and now has some pretty red berries. This is growing underneath the blackhaw viburnum (Viburnum prunifolium), which unfortunately did not produce any berries this year. Some volunteer fennel from who knows where has spread around a relatively sunny part of the garden, and appears to be menacing my current experiment with container growing: a Tophat blueberry. 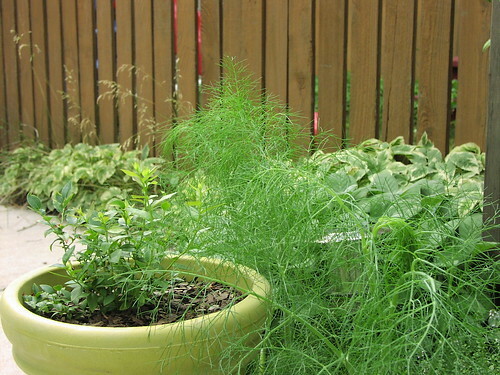 The fennel smells lovely, so I let it go where it will, but I’m contemplating digging up a couple for their bulbs. 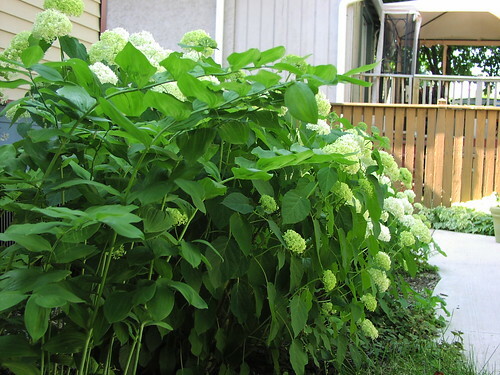 Yeah, I already have loads of pictures of the hydrangeas (Annabelles and oakleafs), but I like this big picture view too much not to post it! The water hose has become a permanent fixture in the garden — all the local thunderstorms have bypassed us, and the new plantings are suffering a bit. 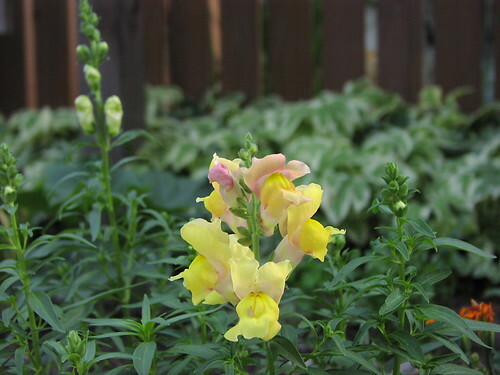 I’m watering the older perennials a bit too, but only every two to three weeks. 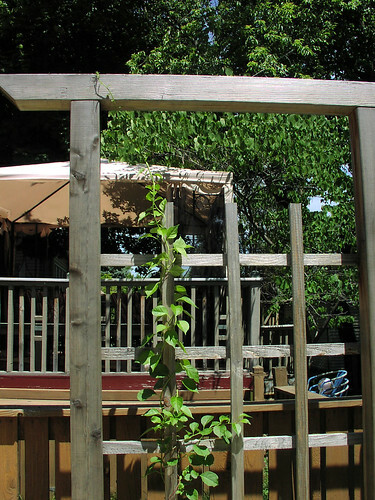 I’ll post pictures of the vegetable and herb gardens once they look a little less unsightly. The chard is hanging in there, but the kale has totally bolted. I hate to rip it out without getting one meal out of it, but it seems to be the thing to do. I still have some sunflower seeds – perhaps I’ll plant those in their place. On the positive side, the oregano is doing really well. I think I should thin it out and sell it for ground cover, if only so it doesn’t take over the entire bed! Coneflower blooms are coming soon, daylilies and the pickerel weed have just started blooming. No goldfish babies yet, but I’m sure they’re just around the corner! 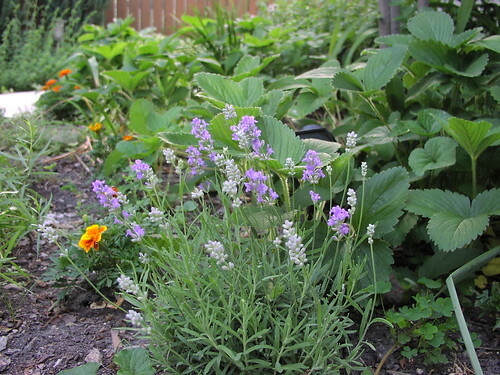 Lavender “Blue Cushion” with Durango Flame marigolds and strawberries in the background. Now for the mystery: one of the Annabelles had some atypical flowers last year. 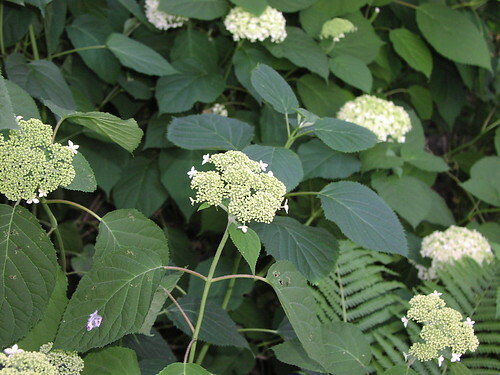 They looked a lot more like the native smooth hydrangea (Hydrangea arborescens) lacecaps, with only a couple of the showy sterile flowers on the outside. Since the local pollinators loved the atypical flowers (and ignored the standard Annabelle blooms), I didn’t trim those stems back this spring. Result: lots of lacecaps, although they haven’t bloomed enough to bring in the bugs in full force yet. Has anyone else seen an Annabelle revert to the species? Or seen any other cultivar do this? 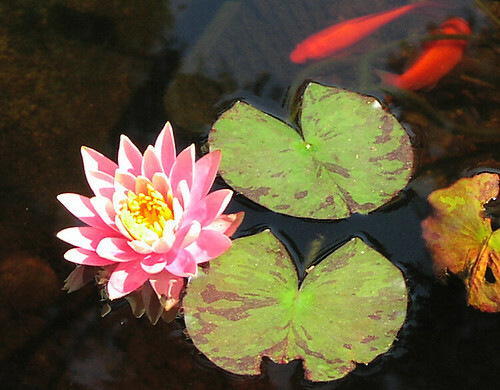 The water lily bloomed for the first time. No cicadas have shown up in the yard, although they are pretty noisy in the forest preserve 2 miles to the west. The kale and chard in the garden by the side of the garage are being nibbled by something, although I’m unsure whether it’s bugs or bunnies at fault. Interestingly enough, the marigolds there are nibbled down to nothing, but the marigolds 10 feet away on another side of the garage are just fine. All three of the Caroline raspberry canes have leaves and one is even trying to flower (I’m pinching the buds so they concentrate on growth this year, not fruiting). 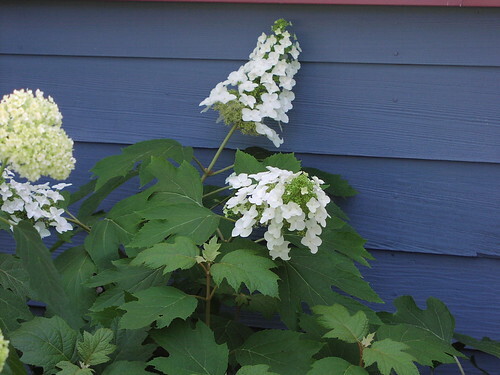 The oakleaf hydrangeas (Hydrangea quercifolia) are just starting to bloom; the Annabelle hydrangeas have a few days to go. Check out the size of the leaves on the oakleaf! 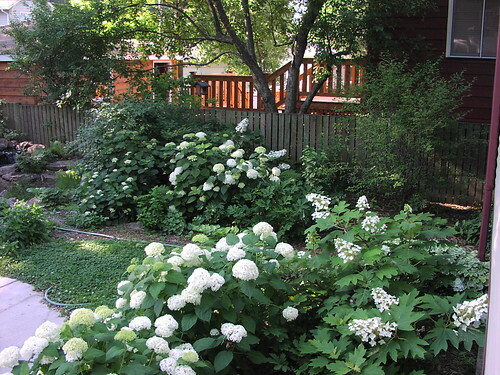 When your backyard is 37 feet wide, you end up looking at the neighbor’s yard a lot. 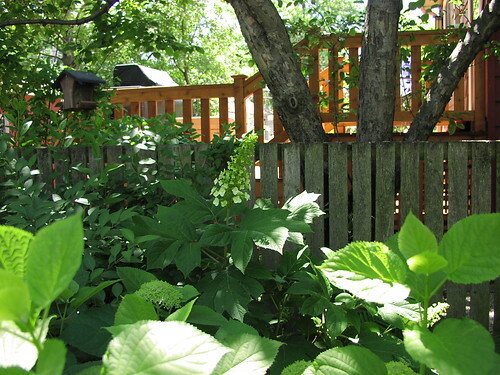 The plants in my yard that are interesting right now just happen to be near the fences, so you get a peek at both neighbors’ backyards as well. 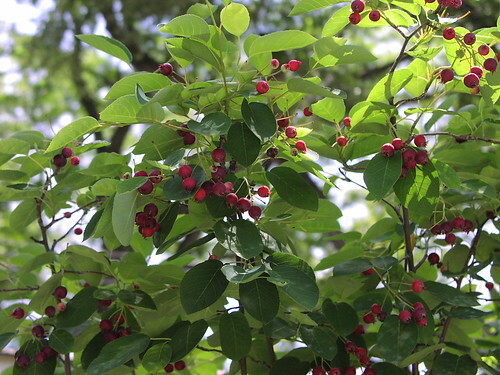 It’s June, and the serviceberries (a.k.a. Juneberries a.k.a. Amelanchier x grandiflora ‘Autumn Brilliance’) are ripe. So far today, robins have been the main consumers, including a fat fledgling and its busy parent. A couple of female cardinals have also stopped by as well. The tree is young enough that the robins have a heck of a time balancing on the thin berry-laden branches; my day has been punctuated by their indignant chirps as the branch bends and drops them unceremoniously on the ground.